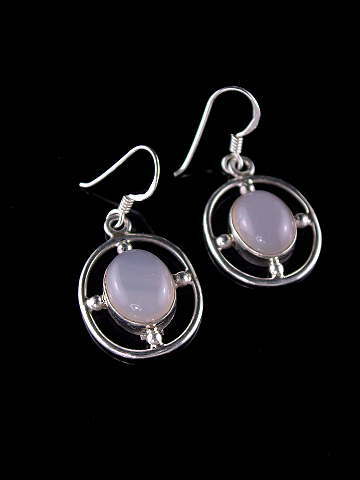 Simple cross-inspired design 925 Sterling silver earrings set with super quality oval Rose Quartz cabochons. A much overlooked pink stone, in favour of ever-more exotic specimens. Rose Quartz is THE stone of unconditional love. Most people know about the properties of this sweet, pink stone. It has been used and marketed for thousands of years as a Love Stone, which indeed, it is. It does, however, have a deeper mission. If you are interested to read more about this crystal, click on the A to Z pink logo at the top left of this page, and it will take you to our online Crystal Directory (without navigating away from this page, as it opens in a new window).